Social media users are banding together to expose attendees at the Charlottesville white nationalist rally to make sure their employers, friends, and neighbors know their names. A man identified as Cole White was fired from his job at a Berkeley, California restaurant Top Dog when his participation in the rally was revealed by the Twitter account @YesYoureRacist. @YesYoureRacist, which has 290,000 followers, has been been on a mission to call out racism on the internet since the account was opened in October 2012. After a car rammed into a crowd of counter-protesters on Saturday afternoon, killing paralegal Heather Heyer and injuring 19 other people, social media users mobilized in full force to begin naming and shaming the attendees, who included people identifying as neo-Nazis, white nationalists and members of the Ku Klux Klan. "There were hundreds if not thousands of cameras running during the rally at any given moment. I am consistently impressed by amateur detectives who are able to unearth people's names, home addresses, and social media accounts by picking out details from publicly available photos and video," Cole Stryker, author of "Hacking the Future," a book about the history and future of online anonymity, told NBC News. "Anyone who puts on a bandana or a mask and thinks that will do the trick is fooling themselves, and should be prepared to accept what's coming to them," he said. Early Sunday morning, @YesYoureRacist and legions of people on Twitter got to work, sharing photos in the hope someone would recognize the people in them. 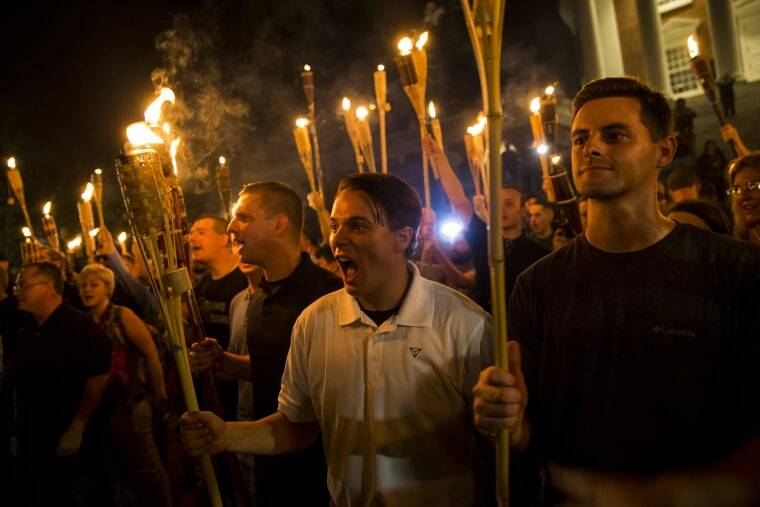 Before his identity was released, Peter Cvjetanovic, a student at the University of Nevada Reno, was just the young, angry looking white man carrying a Tiki torch through the streets of Charlottesville. The photo, showing hate and furor, went viral. Now that the world knows his name, a Twitter account purported to belong to Cvjetanovic claims he is, "Changing the world for the better. Here to clear my name. White Nationalist." "I believe that the white culture in the United States is at threat in its own way, and I want to help defend that," he told NBC News' Reno affiliate KRNV. "I understand the photo is very bad looking, but I don't believe you should threaten my family," he said. "To me, that's monstrous. You can call me a Nazi. You can hate my ideology. But I wouldn't threaten anyone." Cvjetanovic said he identifies as a white nationalist and does not believe "that whites are inherently superior to any other race." On Sunday, Marc A. Johnson, the president of the university, issued a statement saying, "Racism and white supremacist movements have a corrosive effect on our society. These movements do not represent our values as a university." Other Twitter users also shared photos of people they hoped someone could identify. One photo of a man wearing an 82nd Airborne Division hat while giving the Nazi salute had been retweeted more than 18,000 times as of Monday afternoon. "These people went with the intention of making a statement and I think they should have expected to be in pictures," Allison Matherly, coordinator of digital engagement at Texas Tech University told NBC News. Naming and shaming is perfectly acceptable on Twitter, as long as it doesn't cross the line into threatening behavior and no private information, such as an address or phone number, is shared. Accounts such as @YesYoureRacist are also identifying people who attended an event in a public space, which does not violate any of Twitter's policies. And of course, a picture can speak volumes, but sometimes they don't tell the entire story. YouTube star Joey Salads was initially named on Twitter as being at the event. He discredited by letting his followers know he's on vacation in Jamaica and that the photo used of him wearing a Nazi armband as a "social experiment" at a Trump rally was from a video posted in March. While White lost his job as a consequence of attending the rally, Stryker said some of the people "will be fine and return to their communities, where racism is celebrated." But he doesn't think naming and shaming will cause those at the center of it all to change their beliefs. "We enjoy a powerful catharsis in exposing and punishing people who express objectionable opinions, even people who really do 'deserve' to feel shame, but let's not delude ourselves into thinking we've somehow reduced racism or its power," he said. "We've only pushed it into the dark where it will continue to fester."